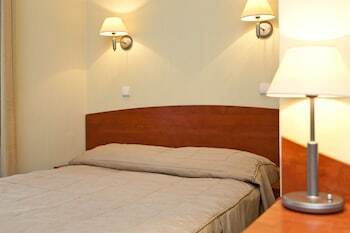 Located in Krakow (Kazimierz), Hotel Kazimierz I is within a 10-minute walk of Wawel Castle and Old Synagogue. Featured amenities include complimentary newspapers in the lobby, dry cleaning/laundry services, and a 24-hour front desk. A roundtrip airport shuttle is provided for a surcharge (available 24 hours), and self parking (subject to charges) is available onsite. A stay at Seatowers24.pl places you in the heart of Gdynia, within a 10-minute walk of Kosciuszki Square and J. Brudziński Muncipal Hospital. Self parking (subject to charges) is available onsite. With a stay at P&O Apartments Praga in Warsaw (Praga Polnoc), you'll be within a 15-minute drive of Old Town Square and Royal Castle. With a stay at Dragon Aparthostel Senatorska in Krakow, you'll be within a 10-minute drive of Main Market Square and Wawel Castle. Self parking (subject to charges) is available onsite. With a stay at Hotel Etna in Kolobrzeg (Dzielnica Uzdrowiskowa), you'll be within a 10-minute walk of Kołobrzeg Pier and Kolobrzeg Beach. Self parking (subject to charges) is available onsite.